All data from Fangraphs, all projection values from ZiPS. Baseball is back! Tomorrow afternoon, the Toronto Blue Jays will take on the New York Yankees to open their 2018 season. While there are certainly reasons to be optimistic and pessimistic about this Toronto Blue Jays team, their starting rotation remains to be seen as a strength. This article will first introduce Fangraph’s Pitch Value system and how they evaluate pitch effectiveness, and later preview the Blue Jays starting rotation so it can be seen what every pitcher has to offer. The idea behind the Fangraphs Pitch Value System is to assign run values to how a pitcher performed while using this pitch. They are then compared to the average results, to determine whether each pitch value is below or above average, and by how much. These can also be viewed for hitters, who generate similar calculations based on how effective they are against each type of pitch. For this article, we will use the standardized calculations which are calculated on a ‘per 100 pitch basis’, since each pitcher’s pitch frequency widely varies, but to provide this further context we will also include their pitch mix from the current year. The limitations of Pitch Values are that they are not always predictive, and can vary from year-to-year. Also, there is likely to be some variance depending on which batters the pitcher had to go up against, since the batter’s ability to hit each pitch will affect the results. If a pitcher were to happen to face batter’s who are less-skilled or less-prone to hitting a curveball (for example), a curveball-heavy pitcher may post higher curveball values due to this lucky arrangement, which may not be entirely indicative of their curveball results going forward. To offset this, their career pitch values will also be included, so if there did happen to be a year where a certain pitch performed wildly different (which again, could be from external factors), their career numbers could also be used to predict their value going forward. In addition, Pitch Values are only calculated for: fastballs (wFB/C), curveballs (wCB/C), changeups (wCH/C), cutters (wCT/C), sliders (wSL/C), knuckleballs (wKN/C), and splitters (wSF/C). Sinkers are included in fastball calculation. The 2017 best and worst values will also be highlighted for reference on how effective each pitch is to the worst and best values that qualified (large enough sample) starting pitchers have produced. Values here were omitted if the pitch was less used in less than 15% of their pitches thrown, which could create small sample size noise and overstate its value. Using this statistic, let’s see where the Blue Jays Starters stack up against the rest of the league. We begin with the Opening Day starter, J.A. Happ. Happ is a curious case as his career numbers probably don’t reflect his true ability at this point in his career - in a good way. After being traded from the Blue Jays to the Seattle Mariners, the Mariners later flipped Happ to the Pirates at the deadline. Here, Happ linked up with pitching coach Ray Searage, who has notoriously shaped-up the careers of many pitchers. Things clicked for Happ who turned a curveball that was arguably his weakest pitch, to one that achieved very good results, possibly because of its reduced usage. His career pitch value on his curveball sits at -0.97 - below average - but in the last two seasons has achieved a curveball value of 1.53 and 1.41, above average and ranking him 18th among pitchers who pitched 100 innings of more last season. 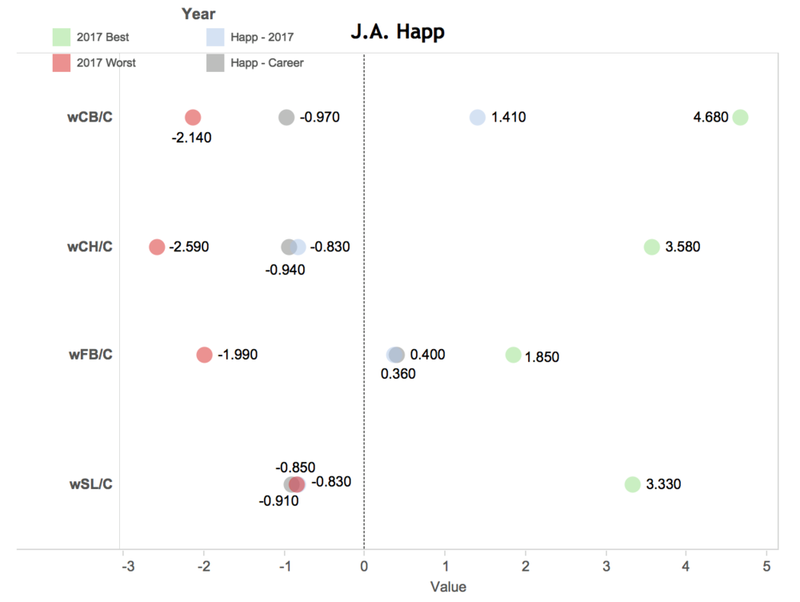 As seen in the graph, Happ had an above average fastball last year and throughout his career, a not-so-great slider and a not-so-great changeup. The thing to remember here is that these values are rate stats, so the fastball grading out positive is the most important part since it’s a pitch he throws ~70% of the time. Happ had an fWAR of 2.9 last season (38th among pitchers with 100+ IP), and is projected to put up an fWAR of 2.7 this upcoming season. The often-underappreciated Happ should continue to be one of the Jays most consistent pitchers. Aaron Sanchez, the 6’4 25 year-old California native is looking to stay healthy and pick up where he left off in the 2016 season. 2017 was a very disappointing season for Sanchez as a blister on his throwing hand kept him sidelined for all but 8 games in the season. In 2016, Sanchez held a 15-2 record with an ERA of 3.00 which was good enough to earn him his first All-Star game nod (replacing injured Craig Kimbrel). Considering Sanchez's small 2017 sample, his 2016 and career numbers will be used for comparison purposes. In 2016, Sanchez held a fastball value average of 0.94, leading him to throw a fastball 74.60% of the time. What makes Sanchez’s fastball so unique is the ball tends to move like a breaking ball, however it still packs extreme heat causing his fastball to produce great results. Sanchez’s fastball value improved in 2016 compared to his career average of 0.86, so there is lots of optimism the young stud can continue this positive trend if he stays healthy. Sanchez's high value and high usage means that he sits down a lot of batters on his fastball, and it is a top pitch. In 2016, Sanchez also saw an increase in his curveball value raising to 0.68 compared to his career average of 0.11, so we may see more of a curveball added to his arsenal in 2018 (threw a curveball 16.27% in 2016). Sanchez saw a small increase in his change-up value in 2016 compared to his career average (0.27 to 0.7), so hopefully he can continue to develop his change-up as well. With one all-star game under his belt already, and his fastball, curveball, and change-up all improving in 2016 compared to his career average, Sanchez has a very bright future as he approaches his prime. If Sanchez can continue to improve in all 3 of his pitches, he has the potential to be a CY Young candidate. In 2016, he produced an fWAR of 3.8, but ZiPS is projecting him at 2.3 fWAR for the coming season. If he can stay healthy, he has a chance to be significantly higher than that, if not the Jays might be in trouble. Injuries seem to be the only thing stopping Sanchez at this point in his career, so he and the Blue Jays will be hoping he stays on the field as much as possible. Coming into his fourth season with the Toronto Blue Jays, seasoned veteran Marco Estrada is looking to bounce back from a year where he saw all 4 of his pitches drop below his career averages in value. The 34 year old has been known as a location pitcher throughout his career, putting the baseball in the corners of the strike zone forcing the batter to make difficult decisions on whether to swing or not. Throughout Estrada’s career, he has evolved into a change-up specialist, however his change-up value fell off a cliff in the 2017 season, dropping below the league average to a weak score of -0.7. This may indicate batters have solved the puzzle of his change-up pitch, or it could indicate age is taking a toll on Estrada’s performance (he will be 35 in July). With a seasoned pitcher like Estrada however, there is always room for optimism as he could rebound in the 2018 season and bring his change-up value closer to his career average where his change-up value sits at 0.63, above the league average. Estrada’s fastball saw an insignificant value drop of 0.05 compared to his career fastball value of 0.28, indicating his arm strength is still healthy while he’s approaching age 35. Estrada saw the biggest drop in his curveball, dropping to a disappointing -1.57 in value, which may explain the low percentage of this pitch choice in 2017 (7.70%). Estrada’s cutter has always been very below average, and he saw this pitch drop in value as well to -1.63 while only throwing a cutter 6.70% of the time. The low percentages of curveball and cutters thrown in the 2017 season indicate he’ll rely heavily on his fastball and change-up again in 2018, so hopefully Estrada can rebound this season and find his change-up groove again. Even in a down year, Estrada managed an fWAR of 2.6 in 2016, and is projected for 2.1 fWAR this coming season. Estrada was a guy who had outperformed his FIP in each of the three previous seasons before last, and will likely need to find out how to do that again this coming season, and figure out how to surpress contact like he used to. The would-be Opening Day starter had he not picked up a minor injury in Spring Training, many look to Marcus Stroman as the face of this ball club. Standing at 5' 8", Stroman is proof that Height Doesn't Measure Heart, and that if you can throw a baseball, you do not need to tower over the competition to be a starting pitcher. Nasty, even though it missed the zone. His fastball grades out as above average as well, which is very valuable given the high usage. His tertiary pitches don't grade out as well, with his cutter and curveball getting near-average pitch values throughout his career. His 2017 cutter value was left in the graph to illustrate how a small sample size can affect this stat. His usage was only 2.4% last year, and a few unlucky results could really sway the pitch value stat. This shouldn't be a reason for concern. Stroman had an fWAR of 3.4 last year, and ZiPS expects him to take another step forward this season projecting an fWAR of 4.5 this season. Expect him to battle with Aaron Sanchez this year to be regarded as the team's Ace. In 2017, Garcia’s fastball had a value of 0.28. He threw a fastball 60.36% of the time in 2017, and considering it's above average results, is a good weapon for him. Garcia’s curveball took a statistical dive in 2017 as he had a career curveball 0.03, and in 2017 this value dropped to a dismal -1.87, putting it in the lowest tier of value for qualified starters. In 2017 he only threw a curveball 6.74% of the time, which means that the negative results didn't hurt him overly often. We shouldn’t expect to see Garcia throw a lot of curveballs this year unless he can get better results with it. Garcia’s slider value in 2017 was right on par with his career slider value at -0.79, so we may see some reduced usage, but this pitch does seem to be one of his weaker ones. Garcia also saw a small improvement in his change-up last year, bringing his value up to 0.24 compared with his career change-up value of 0.11. Perhaps Estrada and Garcia can work together to improve one another’s change-up as Estrada is considered a change-up specialist who had a terrible year last year. Garcia put up an fWAR of 2.1 last season across his 3 teams. ZiPS projects him to put up an fWAR of 1.6 this season, which is perfectly acceptable for a 5th starter. If Garcia can get into a groove and continue to get good results on his fastball and change-up values, he will fit well into the Blue-Jays pitching rotation and he can be a valuable asset to the team for his pitching, leadership skills, and World Series experience. If not, it's a one-year deal that won't hurt in the long-run, which makes it a good signing considering where the Jays are at in this point of time. Happy Opening Day everyone, we hope you'll follow along with QSAO as the season progresses for more Jays and MLB analysis. Catch the Blue Jays Opening game against the New York Yankees on March 29th at 3:37pm on Sportsnet Ontario.